1:4-6: John, To the seven churches in the province of Asia: Grace and peace to you from him who is, and who was, and who is to come, and from the seven spirits before his throne, and from Jesus Christ, who is the faithful witness, the firstborn from the dead, and the ruler of the kings of the earth. To him who loves us and has freed us from our sins by his blood, and has made us to be a kingdom and priests to serve his God and Father--to him be glory and power for ever and ever! Amen. Futurists see this passage as predictive of a future to us coming of Christ at the end of our present age when the saints will be resurrected, and join Christ in defeating the forces of evil, establishing His Kingdom and beginning the millennial reign. Some futurists see duality in this prophecy in believing Christ came in some sense in the A.D.70 event but believe the main thrust of this prophecy is a future to us second coming. No scriptural evidence is offered to validate a duality of this passage. Futurists will acknowledge that John’s message was addressed to seven existing first century churches but often express the belief that these seven churches represent the church throughout history. Others believe these seven churches represent seven eras of church history culminating in the final era leading to the return of Christ. While some historical parallels are given for this position, these parallels are usually presented within the context of some particular group claiming to be the one true Church and then tracing their supposed history through these assumed church eras. There is no reason from the scriptural text itself to hold to either of these views. Preterists simply acknowledge John’s message as being directed to seven first century Churches. Preterists see no applicability beyond the first century other than learning spiritual lessons from what these Churches experienced. Preterists see Christ’s coming being a near to occur event in the first century and take as literal John’s statement that these things were to soon take place. This coming is seen as establishing a spiritual Kingdom into which one can enter through resurrection which is seen as passing from spiritual death unto spiritual life. "If you, even you, had only known on this day what would bring you peace--but now it is hidden from your eyes. The days will come upon you when your enemies will build an embankment against you and encircle you and hem you in on every side. They will dash you to the ground, you and the children within your walls. They will not leave one stone on another, because you did not recognize the time of God's coming to you." Preterists point out that history records the Romans built an embankment around Jerusalem during the war and killed anyone who tried to escape. The temple was totally leveled and became a farm field. This is the coming that Preterists believe is spoken of and anticipated throughout the NT writings. There is additional material in this passage that does not have direct bearing on our comparing the preterist and futurist perspectives but nevertheless needs to be addressed since we are examining the Revelation as a whole. Revelation 1:8: "I am the Alpha and the Omega," says the Lord God, "who is, and who was, and who is to come, the Almighty." In Revelation 11:16, we read: “We give thanks to you, Lord God Almighty, the One who is and who was, because you have taken your great power and have begun to reign." Because of the phrase “Have begun to reign,” This passage would appear to refer to Christ. Now let’s return to verse 4 and 5. John, To the seven churches in the province of Asia: Grace and peace to you from him who is, and who was, and who is to come, and from the seven spirits before his throne, and from Jesus Christ, who is the faithful witness, the firstborn from the dead, and the ruler of the kings of the earth. Distinction is made between the one associated with the throne before which are seven spirits and the person Jesus. Who is associated with the throne? In chapter four is a description of the throne on which sits the Lord God Almighty who is characterized as “who was, and is, and is to come." It is the Lord God Almighty who is identified as He “who was, and is, and is to come.” In chapter five, the one that sits on the throne is seen as handing the scroll to Jesus Christ who we know from a variety of scriptures, is represented by a lamb. The lamb (Jesus) is seen as separate from the Lord God Almighty who sits on the throne and therefore it would appear that Jesus is not the Lord God Almighty who is plainly identified as “him who is, and who was, and who is to come.” Apparently, this title is not referencing Jesus but God the Father. Who or what are the “seven spirits before his throne.” There has been much speculation about this. The best observation appears to be that these seven spirits represent a composite of the Holy Spirit. This conclusion is based on a passage in Isaiah where six attributes of Gods Spirit are mentioned along with the Spirit itself which equals seven. Isaiah 11:1-2: A shoot will come up from the stump of Jesse; from his roots a Branch will bear fruit. The Spirit of the LORD will rest on him-- the Spirit of wisdom and of understanding, the Spirit of counsel and of power, the Spirit of knowledge and of the fear of the LORD. Let’s briefly address the phrase “first born from the dead” as found in John 1:5 in reference to Christ. If being born from the dead is to be equated with physical resurrection from the dead, Christ would not be the first person born from the dead. Lazarus, as well as several others, experienced physical resurrection. Such resurrections, of course, were to temporal life as these folks died again. Christ was resurrected to eternal life and is therefore the first born from the dead to eternal life. 7-8: Look, he is coming with the clouds, and every eye will see him, even those who pierced him; and all the peoples of the earth will mourn because of him. So shall it be! Amen. "I am the Alpha and the Omega," says the Lord God, "who is, and who was, and who is to come, the Almighty. “After he said this, he was taken up before their very eyes, and a cloud hid him from their sight. They were looking intently up into the sky as he was going, when suddenly two men dressed in white stood beside them. "Men of Galilee," they said, "why do you stand here looking into the sky? This same Jesus, who has been taken from you into heaven, will come back in the same way you have seen him go into heaven." Futurists will point out that there is no record of Christ coming in the clouds, every eye seeing Him or all the peoples of the earth mourning. Therefore the return of Christ must be an event yet to occur. 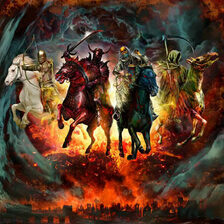 Isaiah 19:1: An oracle concerning Egypt: See, the LORD rides on a swift cloud and is coming to Egypt. Deuteronomy 33:26: There is no one like the God of Jeshurun, who rides on the heavens to help you and on the clouds in his majesty. 2 Samuel 22:10: He parted the heavens and came down; dark clouds were under his feet. Psalms 68:4: Sing to God, sing praise to his name, extol him who rides on the clouds. Psalms 104:3: He makes the clouds his chariot and rides on the wings of the wind. Preterists maintain God is not literally riding on clouds anymore than He is literally riding on the wings of wind. These are all figurative expressions of God revealing Himself in power and glory as He facilitates His will among men. In the case of the Revelation, “coming in the clouds” is seen as an expression of God, through Christ, coming in judgement against Israel no different than when He is seen as riding a swift cloud when coming in judgement against Egypt. Every eye seeing Him is taken as an expression of the collective eyes of those being judged seeing God’s power and glory being manifested. Through His agent Jesus, God is seen as using the Roman armies to facilitate judgement upon Judea. Preterists point out that in the OT God is often seen as bringing judgement upon one nation through the armies of another nation. The phrase “those who pierced Him” is seen as referring to those who were directly responsible for Christ’s death, thus dating Christ’s coming to the first century. The phrase, “all the peoples of the earth will mourn because of him,” is seen as further identifying the first century nature of this event. The Greek word translated “peoples” is the Greek word for tribes and is used throughout the NT to identify the tribes of Israel. The Greek word for earth is often translated land. Preterists believe it was first century tribes of Israel in the land of Israel who were mourning because of the judgement that came upon them. Preterists point to Matthew 24:30-34 where these same Greek words are used when Christ said the tribes of the earth (land) would morn when they see Him coming in the clouds. Christ then says all this would take place before the generation He is addressing passes away. Matthew 26: 63-64: "I charge you under oath by the living God: Tell us if you are the Christ, the Son of God." "Yes, it is as you say," Jesus replied. "But I say to all of you: In the future you will see the Son of Man sitting at the right hand of the Mighty One and coming on the clouds of heaven." It is pointed out that the Greek for future is arti which denotes a near occurrence. The word relates to time closely connected with the present as can be seen in the 35 other passages where it is found in the NT. The Preterist concludes that Christ was addressing the High Priest and his associates and saying it was they who would see Christ coming in the clouds as the Greek arti implies. 9-11: I, John, your brother and companion in the suffering and kingdom and patient endurance that are ours in Jesus, was on the island of Patmos because of the word of God and the testimony of Jesus. On the Lord's Day I was in the Spirit, and I heard behind me a loud voice like a trumpet, which said: "Write on a scroll what you see and send it to the seven churches: to Ephesus, Smyrna, Pergamum, Thyatira, Sardis, Philadelphia and Laodicea." Futurists see John participating in the same suffering being experienced by other Christians of the time and having been banished to Patmos for his preaching about Christ. The Lord’s Day is either seen as Sunday or as “The Day of the Lord” an expression associated with a still to occur return of Christ in judgement to establish His reign on this earth. Being in the spirit signifies being directed by the spirit of God relative to the writing of the Revelation or being carried in the spirit into the “Day of the Lord” and witnessing the events that would take place. The seven churches are seen as seven existing churches in the first century but also as representative of successive and/or ongoing conditions of the Church throughout all ages until Christ returns at some time yet future. Preterists see John sufferings as witness to the tribulation that was going on at the time. His banishment to Patmos was simply an extension of such tribulation. Patmos is a rocky island in the Aegean Sea about 40 miles southwest of what today is the nation of Turkey. Preterists treat as a matter of fact the scriptural account of John being directed to write on a scroll what he was about to see and send it to the seven churches. Preterists do not see these churches as representative of successive or ongoing conditions of the church throughout history as they see no scriptural evidence to support such a conclusion. 12-16: I turned around to see the voice that was speaking to me. And when I turned I saw seven golden lampstands, and among the lampstands was someone "like a son of man," dressed in a robe reaching down to his feet and with a golden sash around his chest. His head and hair were white like wool, as white as snow, and his eyes were like blazing fire. His feet were like bronze glowing in a furnace, and his voice was like the sound of rushing waters. In his right hand he held seven stars, and out of his mouth came a sharp double-edged sword. His face was like the sun shining in all its brilliance. The Futurist and Preterist view this passage in much the same way. In Revelation 1:20, the seven golden lampstands are identified as the seven churches and the seven stars are identifies as the angels of the seven churches. We therefore see symbolism being used in this passage. The person John sees is identified as Christ in verse 17 and 18. The description of Christ appears symbolic of His power and glory and not a literal description of what Christ looks like. Christ is shown as having a doubled-edged sword coming out of His mouth. Ephesians 6:17 and Hebrews 4:12 indicate the word of God is like a double-edged sword. White hair is a token of wisdom. Eyes of fire could portray Christ as able to see everything. Christ dressed in a robe reaching down to His feet with a golden sash around His chest is representative of how the High Priest was dressed. Scripture shows Christ to be our High Priest. John may have literally seen a figure with the characteristics recorded but we shouldn’t necessarily assume this is the way Christ looks in an objective sense. It is unlikely Christ would have a literal doubled edged sword coming out of His month. 17-19: When I saw him, I fell at his feet as though dead. Then he placed his right hand on me and said: "Do not be afraid. I am the First and the Last. I am the Living One; I was dead, and behold I am alive for ever and ever! And I hold the keys of death and Hades. "Write, therefore, what you have seen, what is now and what will take place later. The Preterist sees Christ identified as the person talking to John and instructing him to write about what he has already seen, what was then taking place and what would take place later. Preterists point out that the phrase “what will,” as in “what will take place later,” is the Greek word mello. The primary meaning of this word involves something about to happen. This word appears 110 times in the NT and over and over again can be seen by context to mean something about to take place. It is therefore pointed out that Christ is not telling John to write about things that will take place hundreds or thousands of years in the future but of things that will take place in a short period of time. The Futurist sees Christ’s instruction to John to write about things that will take place later as indicative of events that will take place far into the future. The Futurist does not consider the definition of the Greek word mello and its impact on this passage. The Preterist maintains that the use of mello in this passage negates any possibility of the events spoken as being elasticized into thousands of years into the future and counting. 20: The mystery of the seven stars that you saw in my right hand and of the seven golden lampstands is this: The seven stars are the angels of the seven churches, and the seven lampstands are the seven churches. As already referenced, the seven stars and golden lampstands are associated with the seven churches to which John is writing. The Greek word translated “angels” is angelos which means messenger or envoy. This word appears 186 times in the NT and by context can be seen to almost invariably refer to a non physical, spirit messenger sent by God. The Revelation comes from God to Christ and from Christ to an angel who gives it to John. John gives it to the angels of the seven churches. There is question as to the identity of the angels of these churches. It is felt that John, a physical human being, would not be writing a letter to deliver to spiritual messengers. It is therefore felt angelos in this context refers to human leaders of these seven churches to which John was delivering this message. There are several other NT passages where by context the Greek angelos can be seen to mean human messengers. We cannot ascertain for sure from the context of Revelation whether it is human or spirit messengers that are being spoken of in this passage. Understanding it one way or the other does not impact on our examination of the Revelation. 1-7: "To the angel of the church in Ephesus write: These are the words of him who holds the seven stars in his right hand and walks among the seven golden lampstands: I know your deeds, your hard work and your perseverance. I know that you cannot tolerate wicked men, that you have tested those who claim to be apostles but are not, and have found them false. You have persevered and have endured hardships for my name, and have not grown weary. Yet I hold this against you: You have forsaken your first love. Remember the height from which you have fallen! Repent and do the things you did at first. If you do not repent, I will come to you and remove your lampstand from its place. But you have this in your favor: You hate the practices of the Nicolaitans, which I also hate. He who has an ear, let him hear what the Spirit says to the churches. To him who overcomes, I will give the right to eat from the tree of life, which is in the paradise of God. First century Ephesus had a population of around 250,000 and was the largest city in Asia Minor. Much of the population worshiped the multi-breasted Goddess Artemis, also known as Diana. The city contained a temple to Artemis which at the time was considered one of the Seven Wonders of the World. Paul founded the church at Ephesus and spent three years ministering there. It’s unclear as to what is meant by the accusation that the Ephesians had lost their first love. Their first loves appears to be tied to things they did at first and were apparently not doing now. Therefore it could relate to anything from behavioral issues to doctrinal considerations. It’s noted that they hate the practices of the Nicolaitans. Some early church fathers speculate the Nicolaitans were followers of Nicolas, who was one of seven men ordained as a deacon as recorded in Acts six. It is speculated that he later became a heretical teacher. The Nicolaitans are mentioned again in connection with the church at Pergamum. Nothing is known about the Nicolaitans for sure. It is apparent that whoever the Nicolaitans were, they were perverting the Gospel of Christ. Some Futurists view the letters to the seven churches as representing specific time frames of church history beginning with Ephesus representing the apostolic church period and running until approximately A.D.100. Other Futurists see these letters addressed to the actual historical churches of record with the warnings to these churches being applicable to all ages of the church where similar conditions may exist. Futurists see Christ’s coming to remove the Ephesian lampstand as conditional upon their failure to repent. If they repent, Christ doesn’t have to come and remove their lampstand. Therefore, it is believed that it is not Christ’s second coming that is referenced in this passage but instead a provisional coming involving judgement for failing to repent of drifting from their first love. Futurists view Christ’s promise of the tree of life as taking place at a yet future return of Christ. Preterists see John’s letter addressed to seven churches as dealing with issues germane to those churches. The Preterist sees no scriptural or historical reason to believe these churches represent church eras or conditions extant throughout church history. When Christ speaks of coming to remove the lampstand of the Ephesian church if they don’t repent, He is seen as referencing His second coming. Christ tells the Ephesian church to repent or have their lampstand removed. He also tells them if they overcome they will be given the right to eat from the tree of life. Preterists point out that Revelation 22 shows the tree of life is associated with the return of Christ. Preterists point out that to the Philadelphia church Christ said “I am coming soon. Hold on to what you have, so that no one will take your crown.” Philadelphia is one of the seven first century churches being addressed and it is told by Christ that He is coming soon. Therefore, Preterists conclude that all references to Christ’s coming in the letter to the seven churches pertain to His second coming which is seen by scriptural reference as being imminent to those being addressed in the first century. 8-11: "To the angel of the church in Smyrna write: These are the words of him who is the First and the Last, who died and came to life again. I know your afflictions and your poverty--yet you are rich! I know the slander of those who say they are Jews and are not, but are a synagogue of Satan. Do not be afraid of what you are about to suffer. I tell you, the devil will put some of you in prison to test you, and you will suffer persecution for ten days. Be faithful, even to the point of death, and I will give you the crown of life. He who has an ear, let him hear what the Spirit says to the churches. He who overcomes will not be hurt at all by the second death. Smyrna was located about 40 miles north of Ephesus. It was considered a very beautiful city with a population of around 200,000. Smyrna was very loyal to Rome and had built a temple to Dea Roma, the goddess of Rome. Of the seven messages addressed to the churches, this one is the shortest and contains no rebuke or call to repentance. This message speaks of impending persecution and possible death for members of this church. Smyrna had the largest Jewish population of any city in Asia Minor at the time. Scripture shows that Christians are Jews circumcised in the heart and not in the flesh. The reference to Jews that say they are Jews but are not could reflect Jewish converts to Christ who still believed you must be circumcised in the flesh and follow the Mosaic regulations. The NT shows that persecution from such Jews against both Gentile and Jewish converts to Christianity was rampant and intense. The fact that the Smyrna Christians are seen as being in physical poverty in a city that was economically rich implies economic sanctions against Christians. Some Futurists see Smyrna as representing the church through a series of persecutions from A.D. 100 to A.D. 313. Preterists view this persecution as occurring prior to A.D. 70 as it is Jews apparently spearheading this persecution which would not have been the case after A.D 70 when much of the Jewish population had been killed or dispersed. 12-17: "To the angel of the church in Pergamum write: These are the words of him who has the sharp, double-edged sword. I know where you live--where Satan has his throne. Yet you remain true to my name. You did not renounce your faith in me, even in the days of Antipas, my faithful witness, who was put to death in your city--where Satan lives. Nevertheless, I have a few things against you: You have people there who hold to the teaching of Balaam, who taught Balak to entice the Israelites to sin by eating food sacrificed to idols and by committing sexual immorality. Likewise you also have those who hold to the teaching of the Nicolaitans. Repent therefore! Otherwise, I will soon come to you and will fight against them with the sword of my mouth. He who has an ear, let him hear what the Spirit says to the churches. To him who overcomes, I will give some of the hidden manna. I will also give him a white stone with a new name written on it, known only to him who receives it. Pergamum (Pergamos) was located about 30 miles north of Smyrna and was the seat of Roman government for the entire region of Asia Minor. It had temples to Caesar Augustus, Zeus and the serpent god Asclepius. Christ identifies Himself to this church as the one having the sharp, doubled edged sword. Commentators point out this may have been in response to the fact that the Roman Proconsul had “power of the sword” and Christ was reminding the church that it is He who has ultimate power of the sword and he will use the sword of His month to eliminate false doctrine. Pergamum is shown to be located were Satan lives. This appears to be a symbolic reference to Pergamum being the seat of Roman government for Asia. There is no other historical reference to the martyrdom of Antipas. The Nicolaitans are again mentioned along with those who hold to the doctrine of Balaam. As recorded in Numbers 25, Balaam is seen as, for a price, offering advice to the Moabite King Balak, which Balak used to enticed Israel to sin. Balaam thus became a symbol of someone willing to do or say anything for personal gain. In 2 Peter, chapter two, we see Peter speaking of false teachers infiltrating the church for personal gain and following the ways of Balaam. Apparently this was occurring in the church at Pergamum. As there are a variety of interpretations relative to the meaning of hidden manna, white stone and new name, I will not address them here as none appear to be definitive. Some Futurists see Pergamum as representing the Church between A.D. 313 and A.D. 500. Preterists see Pergamum strictly as a first century church which was suffering persecution at a seat of Roman government. False teachers are identified and told to repent or face judgement at the soon to occur return of Christ.